Small islands face months and even years of rebuilding from a storm that brought record 185 mph winds, and Florida's entire east coast could be in its path. SAN JUAN, Puerto Rico — Hurricane Irma blacked out much of Puerto Rico as the dangerous Category 5 storm raked the U.S. territory Wednesday with heavy wind and rain while staying just out to sea, then headed early Thursday toward the Dominican Republic and Haiti. To the east, authorities struggled to get aid to small Caribbean islands devastated by the storm’s record 185 mph winds earlier Wednesday, while people in Florida rushed to get ready for a possible direct hit on the Miami area. 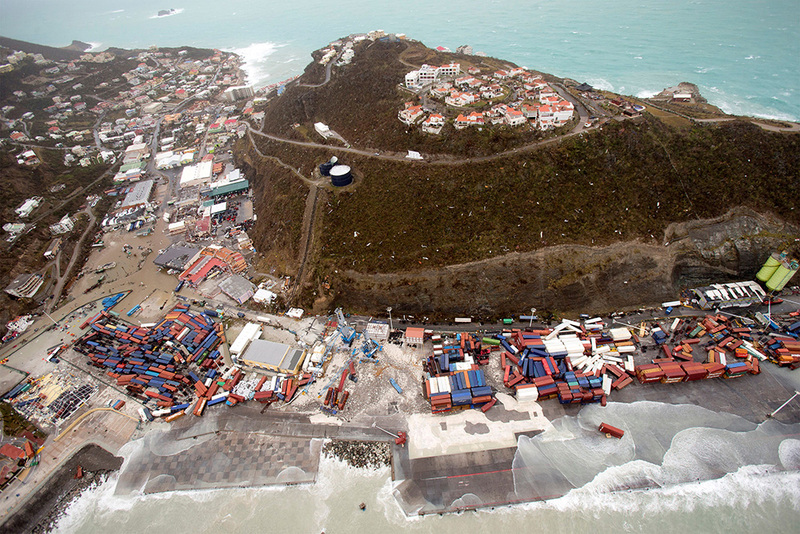 Significant damage was also reported on St. Martin, an island split between French and Dutch control. Photos and video circulating on social media showed major damage to the airport in Philipsburg and the coastal village of Marigot heavily flooded. France sent emergency food and water there and to the French island of St. Bart’s, where Irma ripped off roofs and knocked out electricity. Dutch marines who flew to St. Martin and two other Dutch island reported extensive damage but no deaths or injuries. By late Wednesday, the center of the storm was about 85 miles northwest of San Juan, Puerto Rico, and moving to the west-northwest at 16 mph. President Trump approved an emergency declaration for the U.S. Virgin Islands and Puerto Rico, allowing the Federal Emergency Management Agency and other agencies to remove debris and give other services that will largely be paid for by the U.S. government. 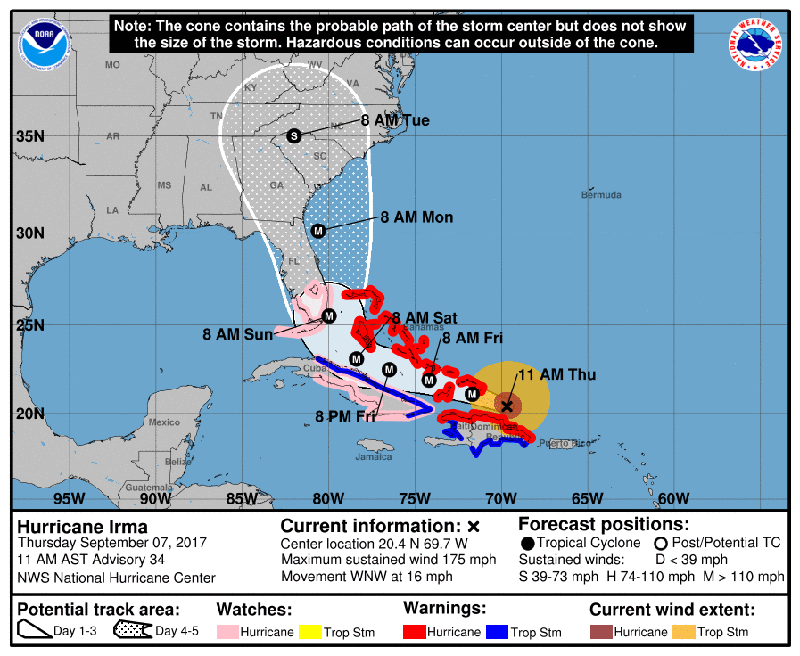 The U.S. National Hurricane Center predicted Irma will remain at Category 4 or 5 for the next day or two as passes just to the north of the Dominican Republic and Haiti on Thursday, nears the Turks & Caicos and parts of the Bahamas by Thursday night and skirts Cuba on Friday night into Saturday. It will then likely head north toward Florida. Scott, who earlier this week declared a statewide emergency, has warned that Irma could require large-scale evacuations and severely impact areas battered last year by Hurricane Matthew, which sent punishing flooding into parts of the state. Officials across Florida responded to the dire forecasts by slowly shutting down the contours of daily life. Schools closed; the NFL postponed the Miami Dolphins’ season opener scheduled for Sunday; the University of Central Florida in Orlando, which could face punishing weather if Irma crawls up the coastline, moved a football game to Friday night; and the University of Miami – the Hurricanes – announced the cancellations of its football game set for this Saturday in Arkansas so the team doesn’t have to travel. 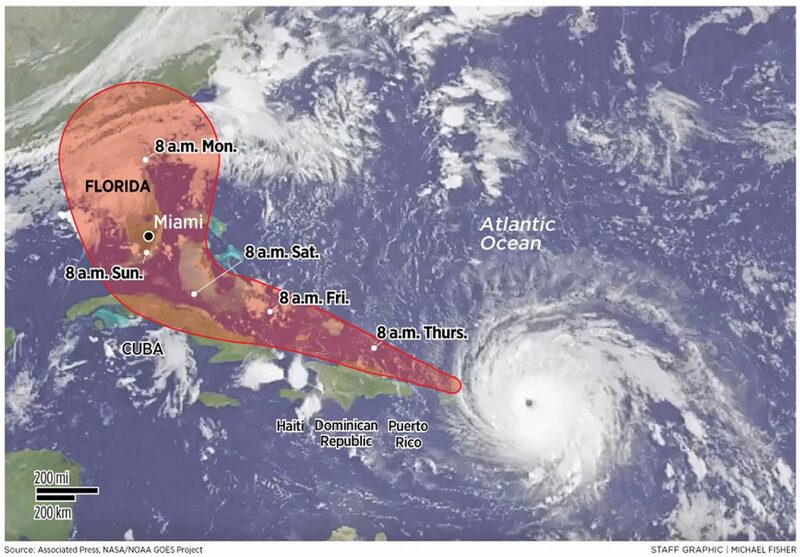 Storm preparations also were underway at two nuclear sites in Florida – 45-year-old Turkey Point 25 miles south of Miami and 41-year-old St. Lucie further north along the coast. They belong to NextEra, a utility with about 5 million electricity customers in Florida. NextEra said that it will shut down its four nuclear reactors before Irma makes landfall. That will reduce the heat in the reactors and the need for electricity. NextEra also said that its reactors could weather a loss of electricity of the sort that caused a meltdown at Japan’s Fukushima Daiichi reactors after the tsunami there in 2011. NextEra spokesman Peter Robbins said that the nuclear plants have diesel generators located 20 feet above sea level inside reinforced concrete structures. 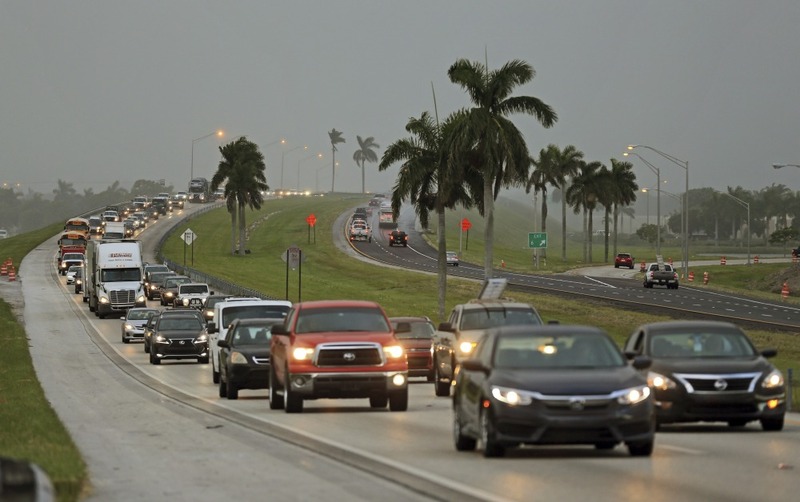 Traffic heads north along the Florida Turnpike near Homestead, Fla., as tourists leave the Florida Keys on Wednesday. This image taken at 7: 15 a.m. Wednesday shows Hurricane Irma tracking over Saint Martin and the Leeward Islands, and its projected path to Florida. 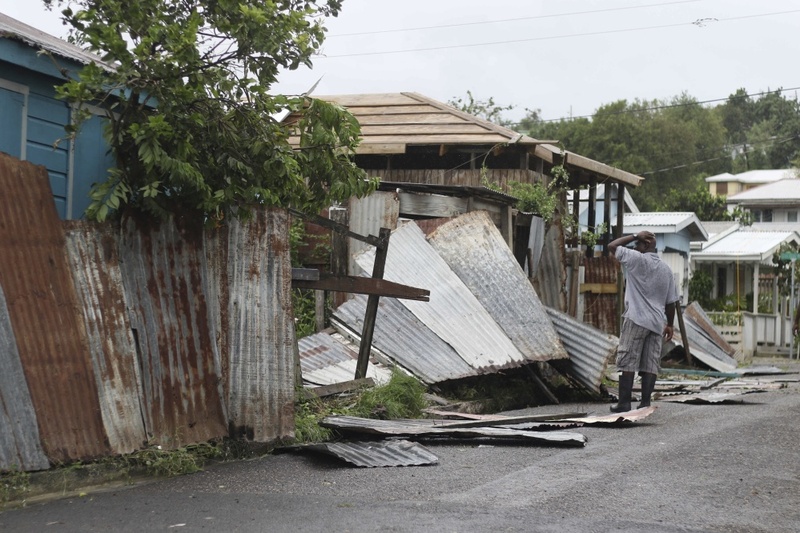 A man surveys the wreckage on his property after the passing of Hurricane Irma, in St. John's, Antigua and Barbuda, Wednesday. Heavy rain and 185-mph winds lashed the Virgin Islands and Puerto Rico's northeast coast as Irma, the strongest Atlantic Ocean hurricane ever measured, roared through Caribbean islands on its way to a possible hit on South Florida. 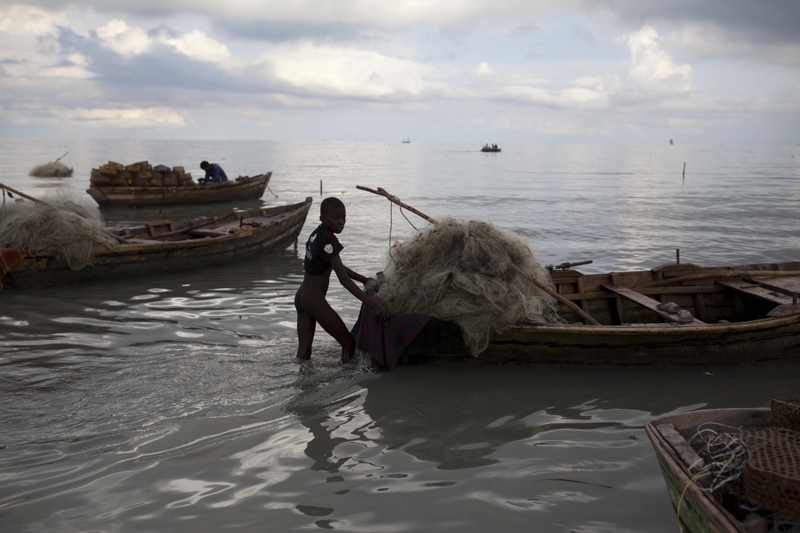 A boy brings his father's wooden boat ashore as a precaution against Hurricane Irma, in the seaside slum of Port-au-Prince, Haiti, on Wednesday. The northern parts of the Dominican Republic and Haiti could get 10 inches of rain. Ron Fogle, 61, of Tennessee, tells his mother, Marian, that he was unable to get a seat on a flight and that he would have to rent a car and drive them to Tennessee, on Wednesday at Tampa International Airport in Tampa, Fla. Fogle traveled to Tampa to pick up his mother before the arrival of Hurricane Irma. 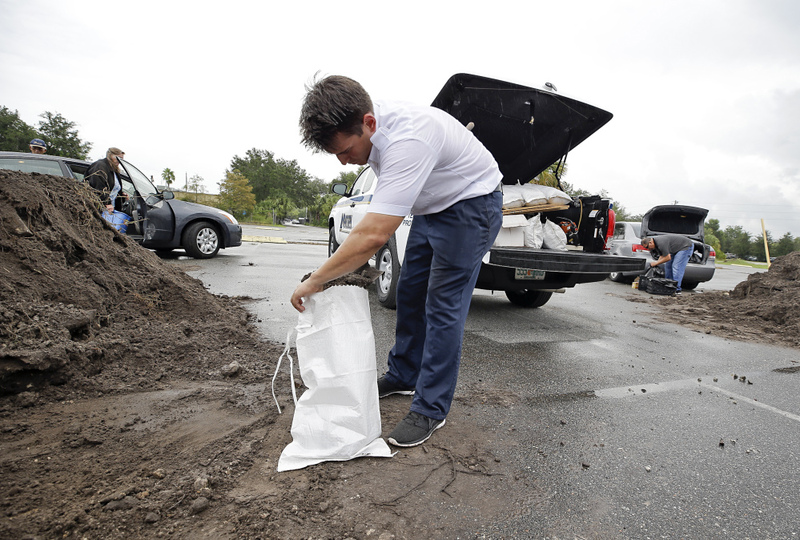 Jesse Dewey fills sandbags at a public works site as he prepares for Hurricane Irma on Wednesday in Casselberry, Fla. 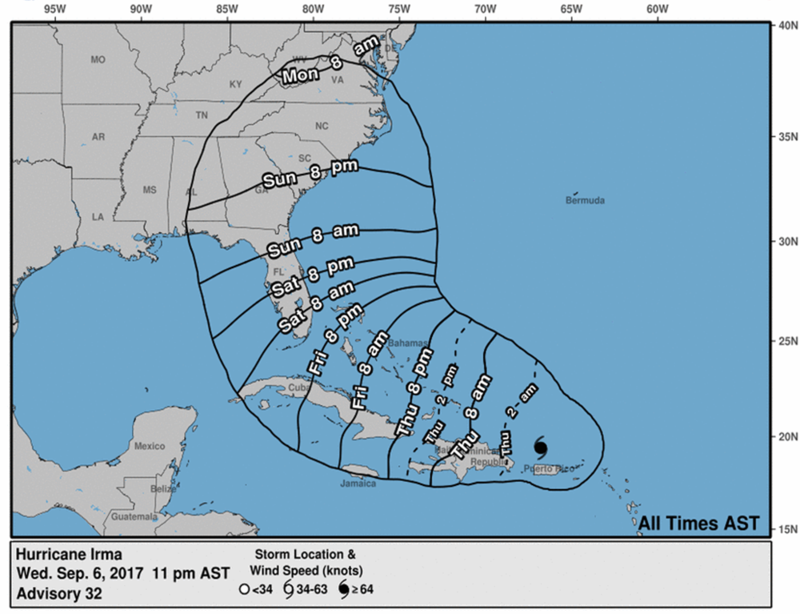 Throughout Florida, officials and residents are making preparations, but forecasts indicate the Keys could take the mainland's first blow from the Category 5 storm. Motorists head north of Tavernier, Fla., on U.S. Route 1 in anticipation of Hurricane Irma on Wednesday. Keys officials announced a mandatory evacuation Wednesday for visitors, with residents being told to leave the next day. 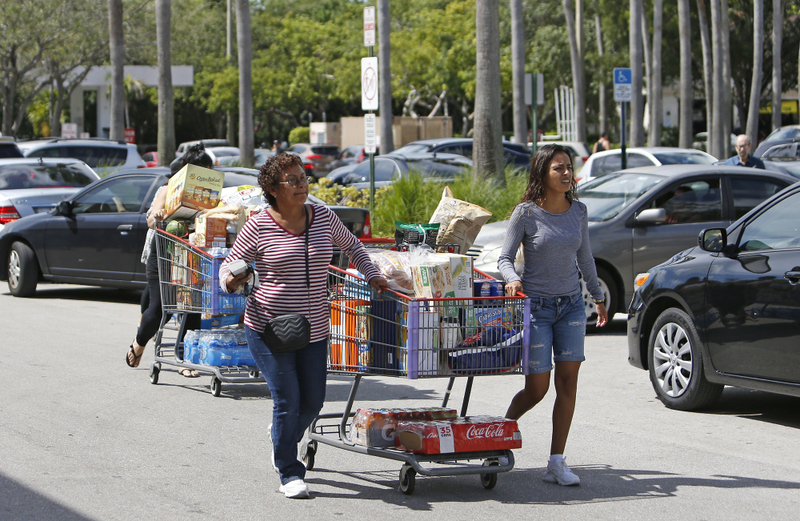 People leave a store with water and necessities in preparation for the arrival of Hurricane Irma on Wednesday in North Miami. 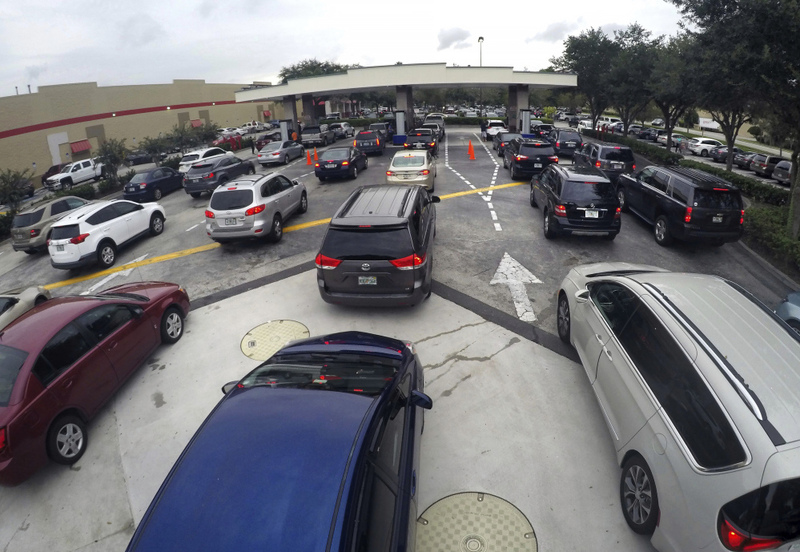 Drivers wait in line for gasoline in Altamonte Springs, Fla., in anticipation of the arrival of Hurricane Irma, on Wednesday. 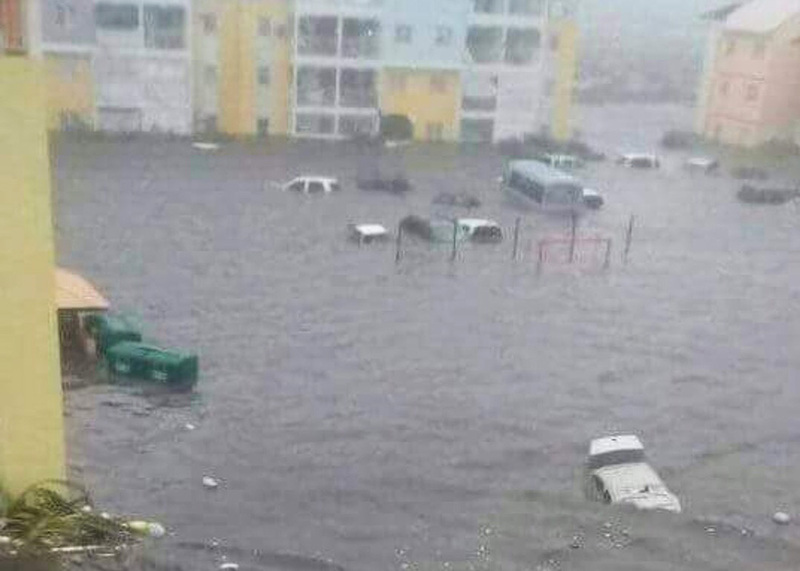 People across Florida who planned to ride out the storm were clearing store shelves of water, food and supplies, and people trying to drive north had to search for gas – and hotel rooms. Many streamed to South Florida’s airports. “Boog” is her sister Karen Romanski, who had been visiting. They saw Hurricane Irma reach Category 5 intensity and early Tuesday decided to evacuate, going online to nab four tickets to Chicago on Southwest Airlines. 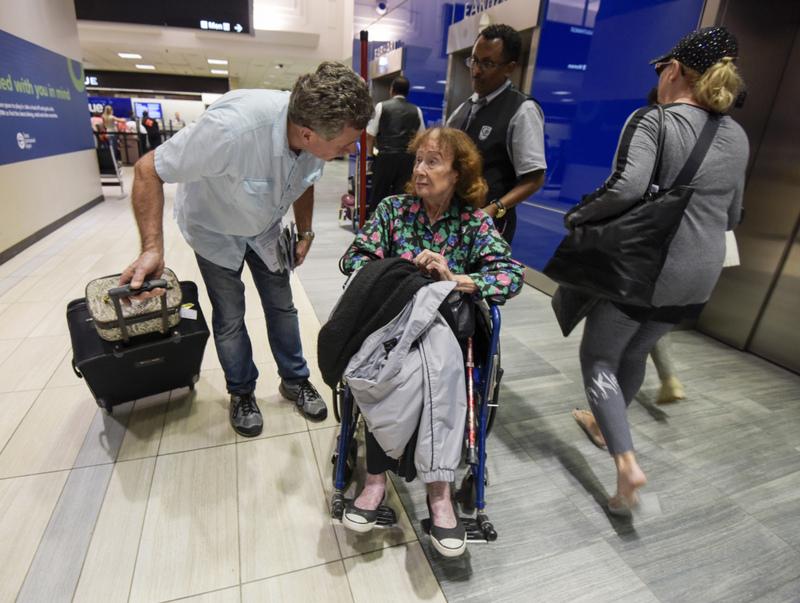 They were evacuating their mother, Virginia Gay, 87, and her friend Thelma Leonard, 91, who sat patiently in wheelchairs Wednesday near the Southwest ticket counter. The airport had been jammed since before dawn with people trying to get out of the state. Florida’s peninsular geography makes flight the best way to flee an oncoming hurricane, but there are only so many planes to catch. By early Wednesday morning, it was hard to get a seat on a plane going anywhere. Seats that were available still for purchase at Florida airports were often exorbitantly expensive, in the range of $2,000.